School records such as diplomas, transcripts,etc. Corporate documents such as articles, mergers, amendments, etc. School records such as college transcripts from the high school, university, etc. must be notarized prior to getting submitted for apostille service. 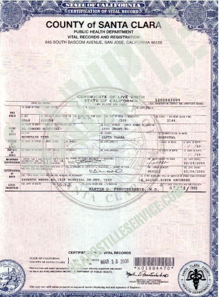 Document certified by a county official (e.g. county clerk) should have a certification date within the last FIVE YEARS or a new certified copy should be obtained from the appropriate county official. 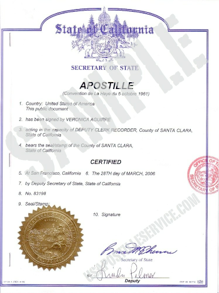 The Secretary of State’s four regional offices (Fresno, Los Angeles, San Diego and San Francisco) can apostille a document notarized by a California notary public ONLY after certification by the county clerk/recorder in the county where the notary public is commissioned. 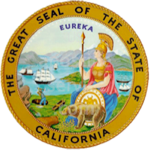 The Secretary of State's Sacramento office can authenticate a California notary public signature on a document without the notary public's signature being certified at the county level. Documents executed by County Health Officers and County Local Registrars can be apistilled ONLY if they are first certified by the county clerk/recorder.